Ichimoku Kinko Hyo is an approach to a trading strategy that combines a series of moving averages. While its display on a chart may be overwhelming at first glance, an experienced user can quickly determine the position of the market from the display. Lets examine the components of the Ichimoku Trading Strategy. There are 5 components and we need to understand how they are built. This is a moving average derived by calculated the midpoint between the highest high and the lowest low over the past 9 periods. Similar to the Tenkan sen, the Kijun sen is derived by calculating the midpoint between the highest high and the lowest low over the past 26 periods. The Chikou Span is calulated by taking the Current closing price and shifting it backwards by 26 periods. On my charts the Chikou Span is shown by a lime green line. The Ichimoku Cloud or Kumo is made up of two lines, the Senkou Span A and the Senko SpanB. Senko Span B is built by taking the highest high and the lowest low for the past 52 periods and forward shifting it 26 periods. Between these two lines is shading that forms the Ichimoku Cloud or the Kumo. 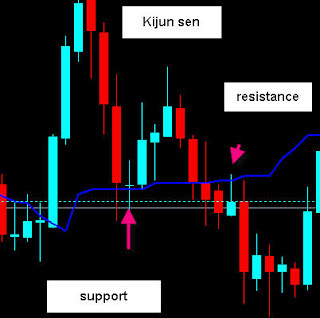 This Kumo allows the trader to quickly visualize support and resistance. What Do These Ichimoku Components Look Like? We can look at some charts and I will add one component at a time. First is the Tenkan sen represented by the red line. To this chart we will add the Kijun sen which is a blue line. You can see how these two lines interact and they can be used for entry signals. We will discuss entry signals later. Now we will add the Chikou Span which is Lime Green on my chart. You can see how the Chikou Span line is following price but is trailing by the 26 bars. Now we can add the Kumo or the Ichimoku Cloud. You can see how the Kumo is extended 26 bars into the future. That is the composition of this chart and as we progress you will see just how powerful this arrangement can be. Once you have some understanding of this chart and its components you will understand why many traders use it for long term trading or scalping on a one minute chart. How Can We Use This Ichimoku Trading Strategy Chart? Let’s have a look at the Kumo first. The Kumo, or Ichimoku Cloud is a great illustration of support and resistance. The interior of the Cloud is generally regarded as a no trade zone because it is mainly a trendless area and could be subject to unforeseen volatility. Price exiting the Kumo is generally an alert for an entry. Of course when price is above the Kumo we assume an uptrend and when below the Kumo we assume downtrend. Quite often you will see price touch the Kumo and bounce back or price may attempt to leave the Kumo and then turn back. Often the Kumo represents strong support and resistance areas. We have to keep in mind that the Kumo represents price action and also market volatility. The cloud will become thicker or thinner based on previous price action. The thicker the cloud, the greater are the degrees of support and resistance. On most charting packages, the color of the cloud will invert as the trend changes. 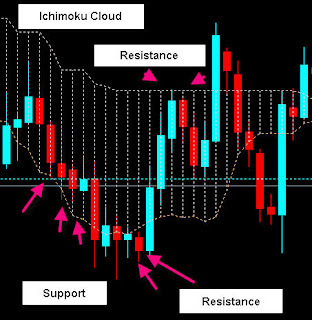 The Ichimoku Kinko Hyo Trading Strategy is generally used for Trend Trading, there are several entry techniques which we will discuss in a future post. The Chikou Span is a most useful feature of the Ichimoku system because it is shifted back 26 periods. It therefore gives a clear picture of the price action 26 periods ago and is easily compared to the current price action. The unique feature is that this relationship can be used to measure what the market is doing currently. If the Chikou Span is above the price we can anticipate more bullish action and if the Chikou Span is below the current price, we can expect bearish action. We therefore can look at a chart and depending on the relationship of price to Chikou Span, we can immediately know if the trend is up or down or consolidating. Another amazing aspect of the Chikou Span is its ability to demonstrate Support and Resistance. For example, we can look back 26 bars from the current bar and determine what the Chikou Span is experiencing from the present candlesticks or the Cloud or the Tenkan sen or the Kijun sen, or, perhaps a 200 moving average or a 50 moving average as those are significant ma’s for support and resistance. This feature alone allows the Ichimoku Kinko Hyo to be used on a very fast chart, such as the one minute chart for scalping. We can also use the Chikou Span on higher time frames to determine what support and resistance may be influencing price. For example, we may be working with a 60 minute chart and want to confirm an entry, we can look at both the 240 minute chart and the daily and even the weekly chart to determine support and resistance. Of course we are wanting to be aware of the relationship of the Chikou Span to the other components of the Ichimoku chart as each of them, being moving averages, can be marks of support and resistance. A couple experts discuss Chikou Span on these videos. Because the Chikou Span is so useful and important, I wanted three videos to assist people in grasping its uses. 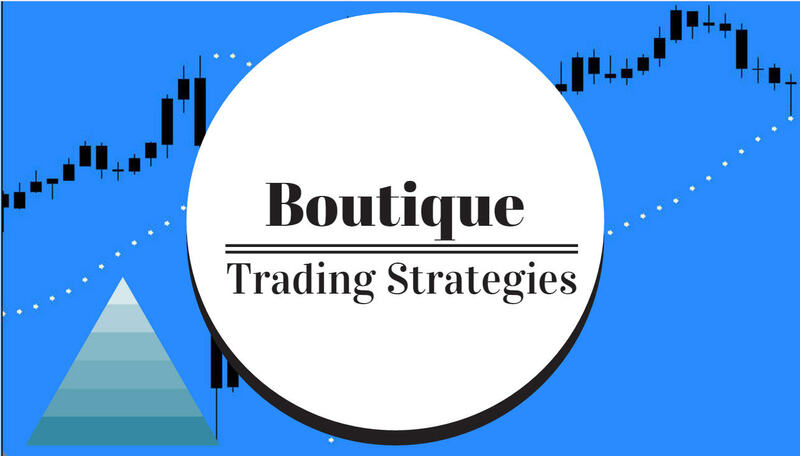 The Ichimoku system offers several opportunities for trade entries. Generally a trader can evaluate each situation and classify the entry as weak or medium or strong. In order to classify a trade, the trader will have to evaluate each aspect of the Ichimoku lines. For each type of entry it can be either bullish or bearish and this to be qualified. Also, support and resistance has to be examined by assessing the Chikou Span position 26 bars back. The relationship to the Ichimoku Cloud or Kumo has to be studied. These entries may sound complex… however, by studying the relationship of all of the parts of the system at the time of entries, a trader can assure himself of a superior entry. Briefly a strong Bullish entry will require that price be above the Kumo, above the Tenkan sen , above the Kijun sen, the Chikou Span must be above the Kumo. For a strong Bearish entry, price has to be below the Kumo, below the Tenkan sen, below the Kijun sen and the Chikou Span must be below the Kumo. In addition, Momentum can be assessed based on the relationship of the Kijun sen and the Tenkan sen.
Overbought and oversold conditions can be assessed by the distance between price and the Kijun Sen.
You can see from the things described that preparation for an Ichimoku trade entry can be very thorough and also worthwhile as many inferior entries are eliminated. The Ichimoku Kinko Hyo trading strategy can be very rewarding and profitable. I want to present a video that was made a couple years ago by Nicole Elliot. Nicole Elliot is a long time trader who, more or less, introduced Ichimoku Kinko Hyo to the western world. In Ichimoku community she is regarded as the expert and I am pleased to have located this video. Each of the five lines in Ichimoku Kink Hyo is actually designed to show support and resistance. I will discuss each now and show an example. Once a person gets used to seeing these they can easily read what is happening with the market. The Tenkan sen on my charts is the red line, you can see that it follows price similar to a moving average. 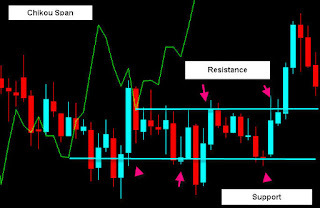 It acts as either support or resistance when price approaches it. What is interesting about this line is that the flat spots are stronger support or resistance. 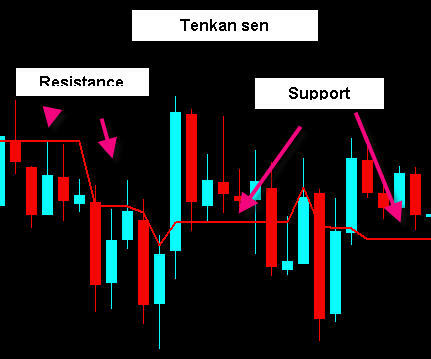 In other words you can look back on the price chart and see levels on the Tenkan sen where you can expect price to run into support or resistance. On my charts the Kijun sen is the blue line….. It has the same characteristics as the Tenkan sen. In fact you will often see the two lines flat in the same location indicating a strong level. The Chikou Span is the green line on my charts. This is a most powerful line for demonstrating support and resistance. The first way you can use it is to count back 26 bars from the current bar and see what is happening there…. that will be an indication as to what to expect on the current bar. You will see if the bar 26 back is running into support or resistance. The second way to use the Chikou Span is to notice where there are little hooks in it. as those all represent where price has been slowed or reversed due to either support or resistance. You can go back 20 years and find these levels using this method. You can start with a monthly chart and mark the levels and then the weekly chart and then the 4 hour chart etc, right down to the time frame that you wish to trade, to mark the levels and therefore be prepared. The Chikou Span is a most useful tool for anticipating the market. The Kumo is made up of two lines which I will call Up Kumo and Down Kumo, together they form the Ichimoku Kumo or Cloud. Of course both lines can be either support or resistance. The flat areas of these two lines are especially strong levels. The area between these two lines, the Cloud, is an area of past volatility and is often difficult to trade within… I prefer to not trade when price is in the cloud.